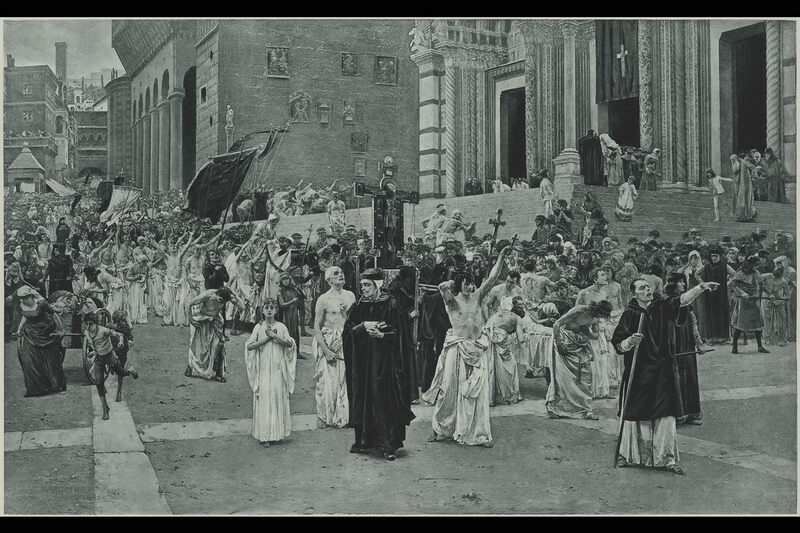 "In this sombre Italian street with its ghastly procession we have indeed an epitome of the Dark Ages. The fanatical madness of the Flagellants broke out at intervals during three centuries - from the thirteenth to the sixteenth - and extended over all civilized Europe. The tyranny and corruption of the times, the fear of the wrath of God, the terror of the plague, the general unrest of men's souls, all combined to set afoot these bands of enthusiasts, scourging themselves as atonement for sin and as substitute for all sacrements of the church and for all the ministrations of the clergy. The painter has reproduced all the characteristics of this terrible march with great artistic intelligence, - the half-naked, white-draped scourgers, filling the street like an army of the sheeted dead and mounting tumultuously the high steps of the cathedral to the terror of the clergy, the gloomy penitents and fanatical monks who carry the banners and the great crucifix and direct the procession, the curiosity and the fear of the populace, the awful doubt of the age. The photogravure plate reproduces with an exactitude that no other method of engraving permits the infinite detail that combines to make the character of this great historical work."